Home / Blog / To, Too, or Two? If there’s a top ten list for grammar gripes, I would guess confusion over to/too/two is on it. Let’s address this common area of confusion. The core problem is that these words are homophones–words that sound alike. But they are also heterographs, meaning they are spelled differently and have different meanings. So we pronounce them the same, but they are different words with distinct spellings, and we have trouble keeping the spellings straight. Actually, few of us have trouble with the word that names the number: two. So, let’s just get to the point of confusion: Do we use the one-o to or the two-o too? I drove my grandma to Bingo. In his will my uncle left his golf ball collection to me. I would like to examine your boots. Samantha is reluctant to taste fried okra. There’s another less common use of to as an adverb though. It’s used adverbially in expressions like “I pushed the door to (into a closed position),” “The patient came to (into a conscious state).” Those are kind of obscure uses though, so let’s ignore them. His harmonica playing is too amazing for words. I want to play the harmonica too. 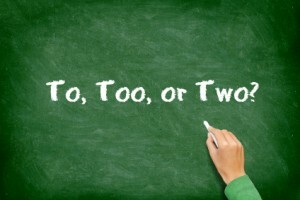 Here are two simple ways to remember when you need the two-o too. Too, in all its definitions, means something like more or in addition. So, remember that when the word indicates more, you need more o’s. Get it? Another way to remember is to mentally replace the word with very and also. If either one makes some kind of sense in the sentence, that means you are using it as an adverb, and you should use too, not to. If the sentence is: My oatmeal is ____ cold. You could insert very and it makes sense. That means you need too. If the sentence is: You can have a dish of oatmeal _____. You could insert also and it makes sense. You need too. If the sentence is: I have never been ___ Cleveland in the spring. You cannot insert either very or also. That means you can stick with to. Personally, I like the first trick better. If something is too good, the too needs more o’s. That works for me. What works for you? Post any comments or questions below. Bloggers love comments. Take the Animal Group Names Quiz! Personally, I don’t have any difficulty keeping these words straight. Some of my students, do, though. For them, I give an example of how to use each word so they can see the differences. I do the same for there/they’re/their, which seems to be a common misuse problem than the misuse of to/two/too.